So, in keeping with the spirit of the last post, I’ll tell you about another Parisian tour we did. Navigating the subway system brought us to a normal commercial district with cafes and stores, similar to many we had been through while we were there. The guidebook led us to a nondescript door opening into a narrow hallway. At the back was a lady behind a window that collected our Euros and then we went through a door and down a narrow stairway. A long way down. 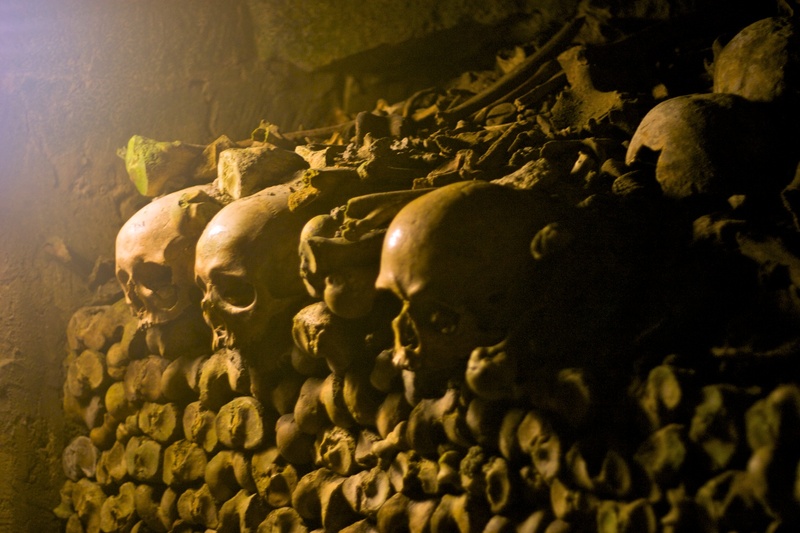 130 steps, then down a long stone corridor and into a room (or a grotto) full of bones. Human bones. We were in the Catacombs. It’s really pretty amazing to see. We’d heard about them before, even seen them on TV, but in person it’s…hard to describe. It’s somber, spooky and overwhelming all at once. The bones are carefully placed, it’s not like they just dumped them. 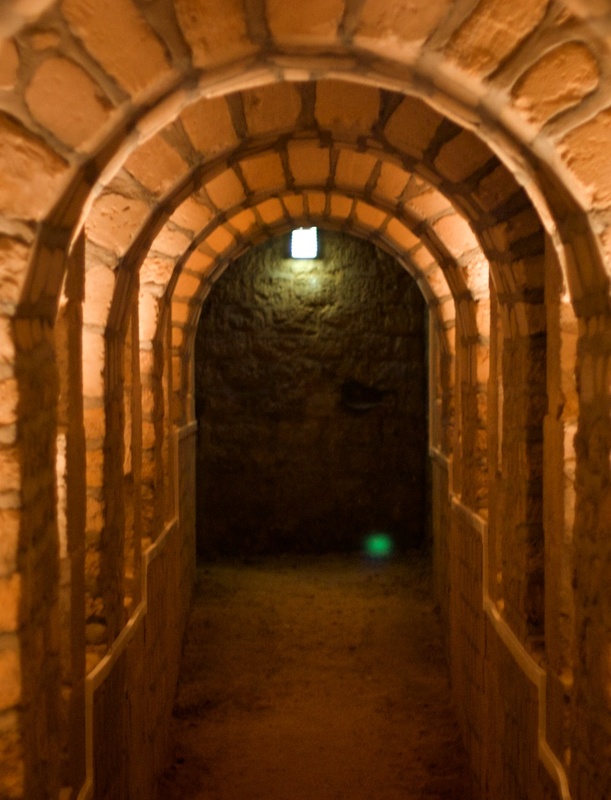 The catacombs were originally quarries but when the cemeteries got exceedingly nasty (which doesn’t even begin to describe the, um, sanitary conditions of the time) they moved the remains on in. Several million of them. That’s lots-o-bones. They placed them in piles according to type, piles of thighs and legs and arms. 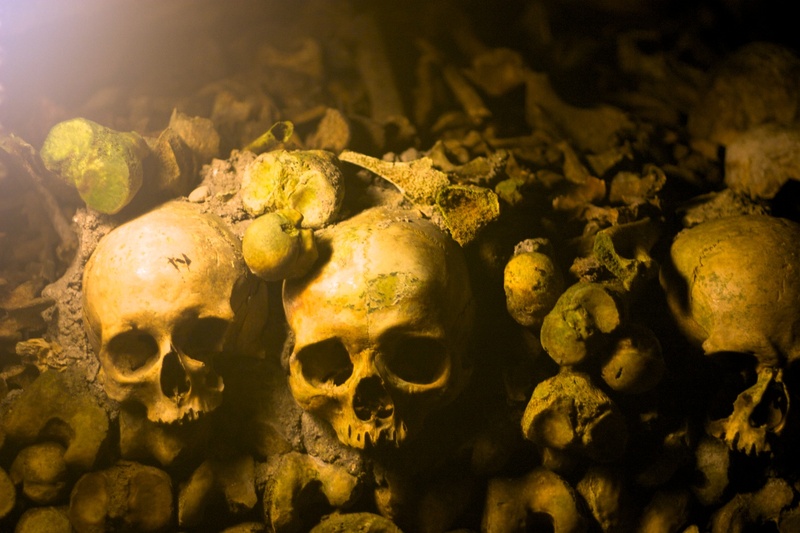 Piles and piles of skulls. Arranged in many different styles. 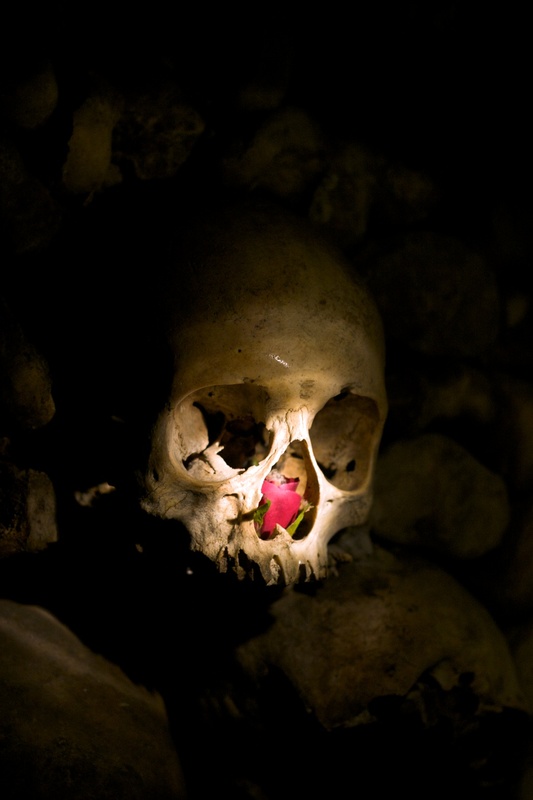 Skulls were used many times as accents. We walked a long way, 2 km, through rooms and corridors all the same and all different. It wasn’t depressing in any fashion, it was fascinating. And then we climbed up another 85 steps and were, rather jarringly, back on the street trying to figure out where we were. It was nice to see the sun. Note: All photos were taken with no flash. The only illumination was the bare electric lights and my mag lite, held by my lovely assistant. I used a fast lens (50mm, f1.8) and got some interesting shots. I’ve seen almost the same shot as the first one below published somewhere. Apparently the rose is a regular feature.